Tarver-Rendon students and staff were surprised on December 5 during a morning assembly. 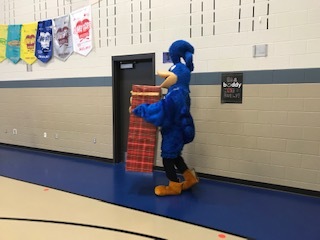 Roadie the Roadrunner delivered a special package to Mrs. Atwood. 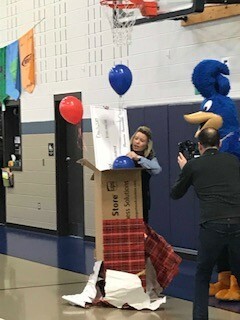 The package contained a check for $100,000 from Farmers Insurance! 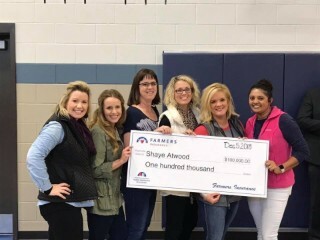 A group of teachers began writing a grant proposal in January of 2018. The grant included building a barn/outdoor classroom, new garden beds, improving current garden beds all in our Discovery Park. We found out in September we were one of the 15 proposals in the running for the $100,000. On behalf of the grant writing team, we would like to thank everyone who voted for our proposal, shared the voting link, and encouraged others to vote. It's because of you that we will be able to make our Discovery Park even better! If you want to watch the grant come to life, join the Tarver-Rendon Elementary Facebook page or the Discovery Park Facebook page.